This document contains revised standards for transfer pricing documentation and a template for country-by-country reporting of income, earnings, taxes paid and certain measures of economic activity. The country-by-country report requires multinational enterprises (MNEs) to report annually and for each tax jurisdiction in which they do business the amount of revenue, profit before income tax and income tax paid and accrued. It also requires MNEs to report their total employment, capital, retained earnings and tangible assets in each tax jurisdiction. Finally, it requires MNEs to identify each entity within the group doing business in a particular tax jurisdiction and to provide an indication of the business activities each entity engages in. Taken together, these three documents (country-by-country report, master file and local file) will require taxpayers to articulate consistent transfer pricing positions, will provide tax administrations with useful information to assess transfer pricing risks, make determinations about where audit resources can most effectively be deployed, and, in the event audits are called for, provide information to commence and target audit enquiries. In October 2002 this is what I told John Christensen country-by-country reporting could do when we first discussed how to tackle transfer pricing abuse. No one ever discussed it before we did. The first proposal for it followed soon afterwards. Twelve years later it's now to be part of the official armoury for tackling the issue. I am, of course, pleased that we've got this far. That does not mean we have all we want on country-by-country reporting. The OECD requirement is vague on some issues, like the approach to consolidation, but equally it is robust on others where we made very strong representations to it. 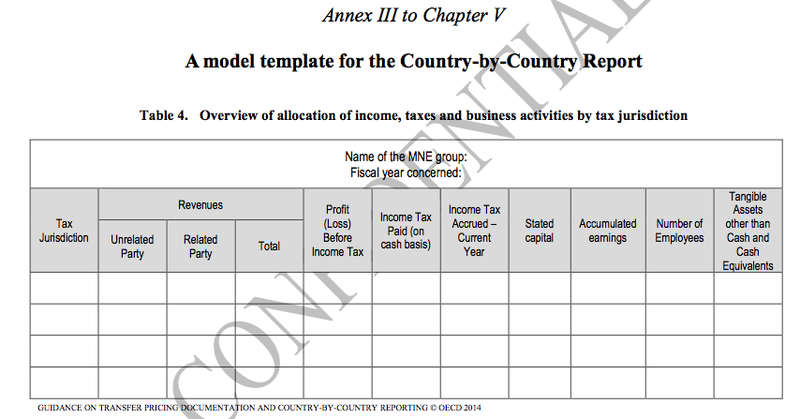 So, for example, every jurisdiction has to be included in the country-by-country reporting template (copy below, taken from pre-release document - confidentiality restrictions have now been lifted; I am not leaking): there is no let out for supposedly immaterial places - which many tax havens might otherwise be claimed to be. And vitally, sales from a jurisdiction have to be split between those to third parties and related parties - so highlighting the impact of potential transfer pricing issues on the profit declared in the location. This data, plus that on employee numbers, tax accrued and paid (something I insisted on in debate in Paris, and which I am glad to see has been agreed) and estimates of capital do now allow any tax authority to undertake a unitary apportionment calculation for any group. This calculation reallocates profits on the basis of where sales are (unfortunately sales by destination is not available in the OECD data, but that will come, I am sure), where employees are and where assets are. Total group profit is apportioned on this basis to see whether declared profits are allocated in a manner broadly consistent with this estimate based on underlying economic activity. If they're close the group is not worth transfer pricing attention and if they are far apart then it is. It's as simple as that. That's exactly what I wanted tax authorities to be able to do, and now they can, which is great news. There is more good news in here though. The first good news is that because profit has to be declared on a country-by-country reporting basis for tax purposes a full set of country-by-country reporting accounts will have to be prepared by every multinational corporation for every jurisdiction in which it operates. There is no other way to get this data. Profit is, after all, a residual measure after every other allocation has been made. So, we now know that full country-by-country reporting accounts will be prepared in the future. And that means something else, which is that no multinational corporation can ever argue ever again that it does not have this data or that it would be too costly to publish it. The time has come for that sham to be dropped. We need country-by-country reporting data on public record and we now know we can have it. The time to conclude the debate on this issue really has arrived. Multinational corporations have a duty to account to each and every jurisdiction where they operate for what they do in that place. The data in this table would be a great start as a basis for published country-by-country reporting data, although ideally some more detail, such as sales by destination as well as source would be added, and a consistent approach to consolidation would be required, but a process has begun and the outcome is, I think, inevitable. The era of country-by-country reporting is arriving. will county-by-country data be made public or is this just part of information exchange between countries? if a company digs it’s heels in and insists that half a dozen employees in the Caymans really do generate 90% of the company’s profits – and i’m guessing they will – will we now see proper legal challenges? I expect foot-dragging from the UK, and an effort behind the scenes to undermine the proposals and all practical efforts to impose them. Further, I expect the UK to stand alone among OECD countries in refusing to pursue the taxes we’re visibly entitled to receive. Yes, I’m a pessimist; but you still have to campaign for taxes to be paid, because it will get even worse if this isn’t kept in the forefront of the public consciousness. Wow Richard what a great endorsement of all your and TJNs hard work and persistence. As an academic I am disappointed to see how far behind the academy has been in bringing truth to light on the massive tax injustices. Of course Prem Sikka and a few others are notable exceptions. I am most impressed by the vast research that is on this site. Innovation does not need to come from the academy as you have proven. I am not sure what you mean by your last sentence sorry? Oh Ok thanks, I understand now. Yes I agree the data needs to be publicly available. That way all stakeholders in various countries can understand what the multinational is doing there and the profits and revenues generated. Also agreed that we are both up far too early! I don’t want to decry your progress which is great. But I do wonder how this is going to be policed. The UK would probably embrace the spirit and letter of regulation , but I wonder if Russia, China, and who knows else will do so too. Profit allocation can be difficult particularly in regard to mobile intellectual capital. And multi nationals can afford to pay the best people to circumvent regulation. I do hope this is not going to be another Western liberal idea that looks good in theory but bad in practice. OK I guess you have to start somewhere. But I do wonder if it is just an exercise for the nice boys. For starters if it is does not include USA multinationals it’s not worth a can of beans. It’s going to be be based on national oversight, no international oversight is available or going to be effective. The world is changing, for example China is on the march and Western liberal sensitivities worth less. 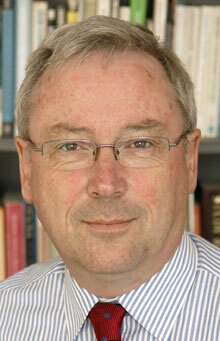 Are we engaging in British self flagellation (again) ? Sorry, but how does that mean it can’t work here? HMRC can only demand information which is in the UK taxpayer’s power or control. If a foreign parent refuses to disclose the global information to its UK subsidiary, the UK company cannot be forced to disclose it to HMRC; and HMRC can normally only deal with a UK taxpayer. Whether there can then be a penalty imposed on the UK company for not meeting its obligations is another matter. As is whether HMRC would get anywhere going to the tax authority responsible for the parent. Sorry but yes I don’t get it. I can’t see what the point is of the UK alone adopting country by country reporting. 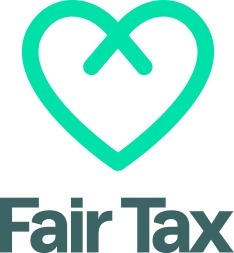 I do want to see UK based groups taxed on their world wide income with transfer pricing thoroughly investigated and removing the sham of tax havens by going beyond the secrecy veil and perhaps treating profits there as UK profits. In other words strict HMRC action when required, but sorry not a bureaucratic procedure which then has to be policed- presumably by higher Audit charges. Please, what concrete benefits will it produce? I genuinely want to know. Decisions taken by the OECD are of no relevance without legislation passed by the United States Congress. Senator Levin introduced country-by-country reporting for companies listed on US stock exchanges as part of the Stop Tax Haven Abuse Act (S. 1533). The Act has no bi-partisan support in the Senate (it was introduced by four Democrats). It would obviously stand no chance in the House. As with all other matters, country-by-country can obviously not succeed without the support and participation of the United States, which represent about a third of tradable global economic output and over sixty percent of financial services. So shall we get real here?